By E.J. Schultz . Published on April 03, 2018. Bud and Beam are getting hitched in a first-of-its-kind marketing partnership bringing together a major beer and whiskey brand. Budweiser in September plans to release a limited-edition brew called Reserve Copper Lager that is aged on Jim Beam bourbon barrel staves. (Staves are wood pieces that makeup bourbon barrels.) Before then, the two brands will begin appearing together at bars. The "beer and a bourbon shot" promotion kicks off this month. Plenty of smaller craft beer brands have experimented with bourbon barrel-aged brews. But Bud and Beam's collaboration marks new territory for two big, iconic alcohol brands, which together account for 365 collective years of distilling and brewing history, according to the brands. 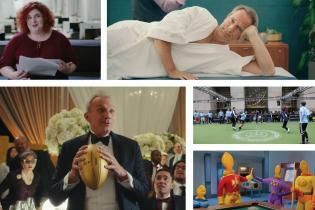 For Budweiser, the upside is obvious. The so-called King of Beers has suffered a long-running sales slump as major beer brands continue to lose share to craft brews and liquor. Bourbon, on the other hand, continues to thrive. 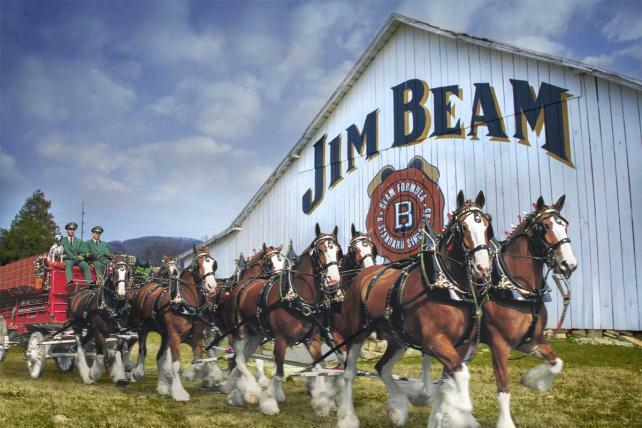 Jim Beam grew sales volume by 6.5 percent last year across all varieties, according to industry tracker Shanken News Daily. For Bud case, the new partnership might amount to an instance of if you can't beat 'em join 'em. But even as Bud loses beer market share, it's still massive; Beer Marketer's Insights ranked it as the third-largest beer last year. So Beam could also gain entry to a new audience of drinkers. 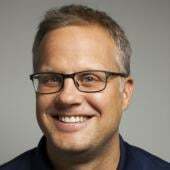 "This partnership feels especially natural given our brands' common values and the pivotal roles they've both played in American history," Rob Mason, VP of marketing for Jim Beam, said in a press release from both brands. Bud and Jim Beam will face competition from other brands that are also blurring the lines between liquor and beer. Corona-maker Constellation Brands, for instance, plans to roll out a new beer called "Western Standard" that will be finished in bourbon barrels as result of a collaboration with a Utah-based craft whiskey maker called High West Distillery that Constellation acquired in 2016. Tullamore D.E.W. 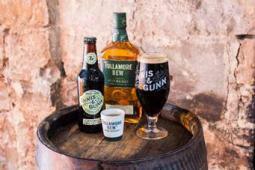 Irish whiskey this week launched a collaboration with a Scottish brewery, Innis & Gunn, to create a limited-edition Scottish stout called Kindred Spirits that is aged in Tullamore D.E.W. barrels. Budweiser's Reserve Copper Lager will be brewed with two-row barley and aged on the Jim Beam bourbon barrel staves to "create a toasted oak aroma and deliciously nutty taste with caramel rye and vanilla notes," according to the press release. The collaboration is timed with the 85th anniversary of the repeal of Prohibition. "After 13 years of Prohibition, we bounced back, illustrating the heart and perseverance of both brands," Ricardo Marques, VP of marketing for Budweiser, said in a statement. It follows another Bud limited edition that debuted last year called 1933 Repeal Reserve Amber Lager that claimed inspiration from a recipe used before Prohibition began in 1920.